Can you imagine this scene? Your good friend, leader, and mentor who died – in front of you – was resurrected, came back to hang out with the gang, and then is LIFTED UP ON A CLOUD IN FRONT OF EVERYONE. Dude. That’s weird. So, when the men in white ask them why they are looking up, well, duh. They just saw their friend get lifted up on a cloud. It makes sense that they are still looking up toward heaven. … and she’s buying a stairway to heaven. However, we are still looking towards heaven. 2000 years later, heaven, life after death, is the focus for many Christians. I went to college in Western North Carolina at a tiny farm school just outside of Asheville. One of my favorite things about living in the Bible Belt was the church signs and tracts that littered the highway. Two gems I recall: There is no fire escape from hell and there is no thermostat in hell. The south, however, is not alone in such … warm, welcoming displays of Christian hospitality and love. I don’t know if there is a book out there with “catchy” slogans on heaven or hell or if the pastors and administrators of these congregations sit around brainstorming the best way to use humor while simultaneously threatening passers by with eternal damnation. For many Christians, faith in Jesus Christ is primarily about answering this question: where will you spend eternity? Heaven or hell? 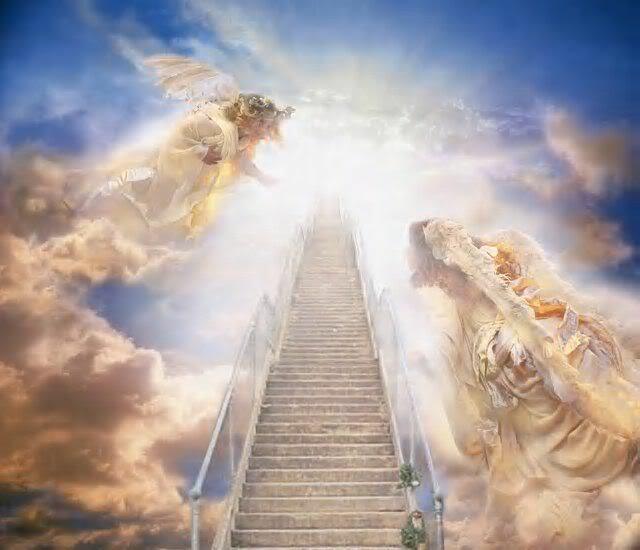 If you want the answer to be heaven, you best accept Jesus Christ as your personal Lord and Savior or in some other way assent to the idea that Jesus is the son of God. I used to have a tract that was all about hell and, at the end, it asked if you wanted to accept Jesus Christ as Lord. If you checked the yes box (yes, there really was a yes box), there was a prayer to say at the back of the booklet that would assure you of your reception into heaven. How I wish I still had that tract. Theoretically, we Lutheran’s aren’t big heaven and hell people. Our belief that we are saved by grace through faith – that we can’t work our way into heaven, but only get there through the power of God’s grace and the Lutheran belief that we are all both saint and sinner tend to keep us away from threats of hellfire and brimstone. But, I’m willing to bet most of us still think about it. Where will we spend eternity? Heaven? Hell? Somewhere else entirely? Heaven and hell, at least in the way we think about them, are relatively new concepts. Much of the way we think about hell is drawn more from Dante’s inferno than the Bible, and our ideas of heaven are as shaped by culture as they are by God’s word. In the Hebrew Bible, Heaven is where God lives. We don’t go there. The dead go to Sheol, the land of the dead (also called Gahanna). Sheol isn’t mentioned a lot in the Bible itself, but it does have more of a life in extra-Biblical Jewish works. Sheol, however, does not last for eternity. Sheol is a place where a person is purified, usually for twelve months, before attaining a higher spiritual state and moving from Sheol to Olam Ham-Ba. However, even though there is writing on what happens to a person after death in the Hebrew Bible and in Jewish writing, this was and is not the focus of Jewish life. The culture in which Jesus lived and died was much more interested in this life, in how life was lived here and how we behaved toward one another and God while on earth. This would have quite an influence on how Jesus thought and spoke about what came after this life, and would have informed the thoughts of the people he encountered. Jesus does talk about eternal life, the kingdom of God and kingdom of heaven. Sometimes they seem interchangeable, sometimes they seem different, but each of them is described in terms that are at times vague and weird. Usually when Jesus starts a statement with the phrase, “The Kingdom of heaven is like…” we can be pretty sure that whatever is coming next is going to be cryptic. Generally speaking, I would say that most of us much together these three ideas: the kingdom of God, the Kingdom of Heaven and eternal life. These things are about what will happen to us after we die and Christ comes again and we spend eternity in heaven. Some of you might have other ideas, but I feel like it is safe to say that this is the Christian narrative (leaving out the discussion of who is and who is not “saved”) of eternal life. And we, good Christians, do what we can to ensure that we will be spending the eternity in heaven, whether that is living in faith or working our way there. Here, in today’s scripture, we get what is possibly Jesus’ only concise and direct description of eternal life. And it is not what most of us think. Eternal life, according to Jesus as recorded here in John’s gospel, is not about what happens to us after we die. Eternal life is a state of being in this world, in this life – eternal life is knowing God. To know God is to have eternal life. To know in this sense implies relationship and understanding. To be in relationship with God and have complete understanding of God and Christ is to experience eternal life. Eternal life isn’t just about what happens to us after we die, it’s not a question of who is in and who is out. Eternal life is knowing God in this moment, in the next moment, in each and every step of our lives and beyond. That is eternal life. And that is heaven. God isn’t in the business of keeping people out, he isn’t in the business of pushing people away from him. God wants us to know God, God came to earth so that we might be in relationship with one another, so that God might know us and we might know God. The problem is that knowing God isn’t easy. To know God, to be in relationship with God, is to be changed by God. To know God is to be filled with God’s unending compassion for our brothers and sisters and that is painful! When we are filled with Gods love we really consider what Jesus might do and, generally speaking, what Jesus would do is the most difficult thing and is often something we can’t bring ourselves to do. Jesus would forgive those who have hurt us the most, would look with compassion on the most difficult people in our lives, would stop to care for those we pass by on the street every day and would feel their pain. These are things we cannot bear to do every moment of every day. So we get moments of eternity. Moments when we are so deeply in love that times seems to stand still. Moments when we see the beauty of the world in such a way that we start to cry. Moments when we are suddenly able to forgive the unforgiveable or moments when we get so deeply in prayer or meditation that our monkey mind stops and we are able to just be. Moments when we forget ourselves and our hurried lives and take the time to extend a gesture of love to someone who badly needs it. Little moments of knowing God. Little moments of being overcome by love. May you have little moments of eternity this day and always.